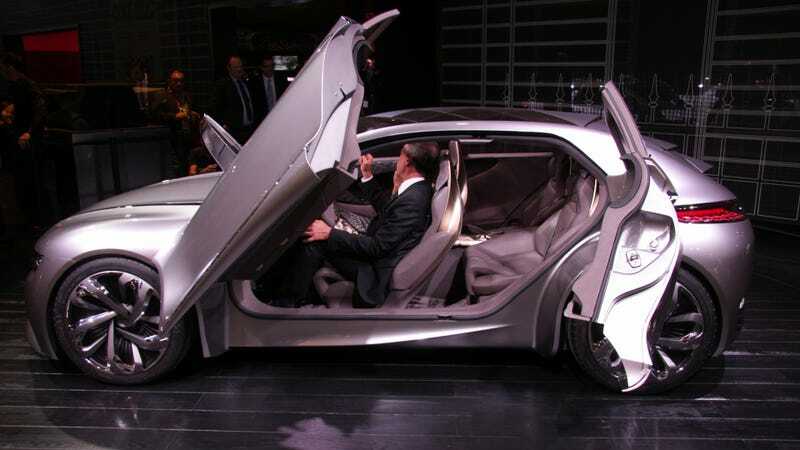 Forget the lack of rear visibility, the bonkers door mechanism and the crystals in the cabin. The Citroën Divine DS Concept is much more than just a bunch of show elements put together for the Paris audience. This has the ingredients of something far more important for France's most quirky automaker. It's a sleek four-door with a luxurious interior and a nice sporty stance. The rest is just mascara. And since the DS is the premium sub-brand of Citroën that's hugely popular in China, the Divide felt closer to reality than the purely design exercise Infiniti Q80, the techno display Renault EOLAB or even the Audi TT with four doors but zero legroom. They could build something like this. Gotta love big doors at cars shows!